So I have been really slack I’m afraid. 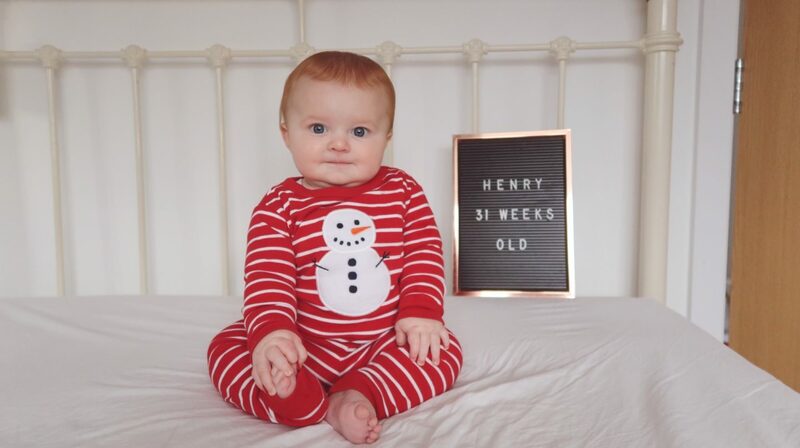 I missed Henry’s 6 month update entirely. I must say I have got a good reason though, we were in the midst of sorting paperwork for our impending house move and sorting out a new car after our nasty car accident which had written off our lovely car! Anyway, Henry is now a very large lump loveliness! How he’s over half a year old now is beyond me. 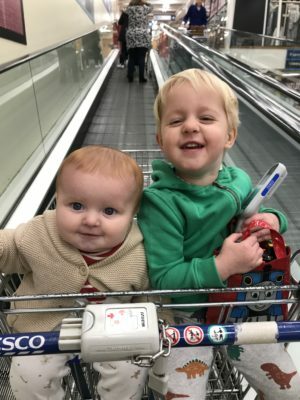 He’s a real cheeky chappy, he adores his big brother and his mummy and daddy. Henry is still breastfed, he loves his milk! He will take a bottle of expressed milk with ease which is so nice as it means I can go out and leave him without having to worry! He’s now started weaning, but my plans of combining baby led and purees didn’t go down so well with him. He entertained purees for all of about 2 weeks, before he decided that it wasn’t for him and he just wanted normal food. He will eat food both with his hands or with us spoon feeding him (dependant on how hungry he is or the consistency of the food). There’s no surprise that he loves his food! He will eat anything and it all goes down (unlike his brother who used to just dribble back out what he had chewed). HAHAHA what’s that?! To be fair he sleeps well-ish. But he’s still waking anywhere between one and four times a night. He will settle back to sleep when’s fed but I don’t know whether he’s actually waking because he’s hungry or just waking and wanting milk because he knows he will go back to sleep. 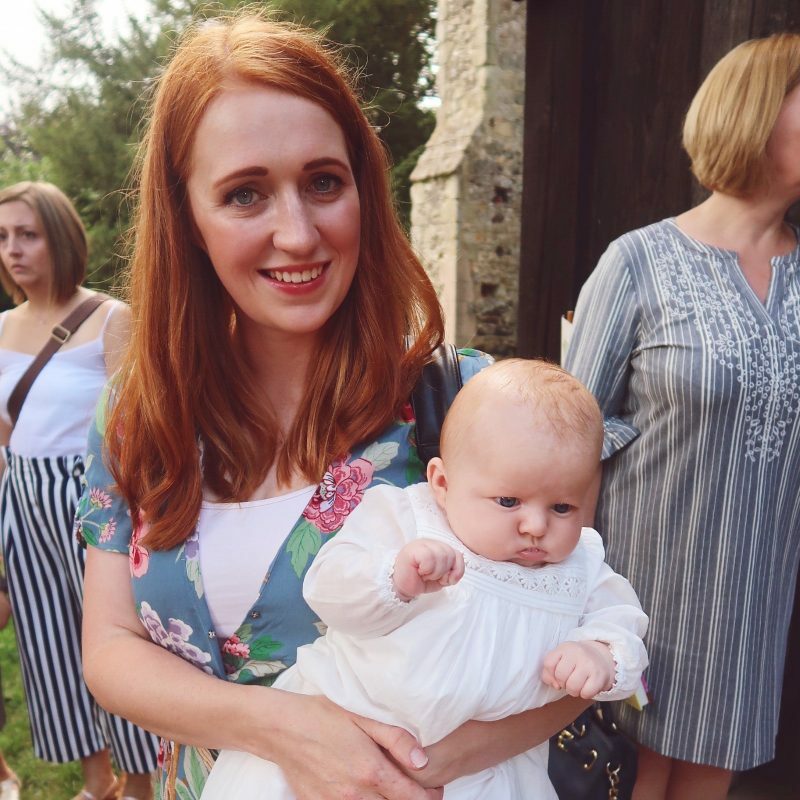 I’ve tried cuddling him, giving him his dummy and he just screams until I quickly relent (because I don’t want to wake Oliver or my husband up!). We’ve also started the process of moving him into Oliver’s room. I thought he may have been waking more in the night because there wasn’t much space in his bedside crib but that doesn’t seem to have been the case! He’s transitioned well but most nights I end up bringing him back in when I’ve had enough of traipsing back and forth across the landing. Henry’s either bum shuffling of commando crawling everywhere now. I think he’s a bit too heavy to lift himself up on all fours, but he manages to get around the room with ease. He will happily find every crumb his brother leaves on the floor (or bits of discarded wrappings). You haven’t been weighed in a little while (I think the last time you were around 22lbs) however I put you on the bathroom scales and you weighed 25lbs!! I find you incredibly difficult to carry around for long periods of time because you are so heavy! But you’re not just rolls, you’re quite long too. Although I’m sure most of your weight is on your little thunder thighs which I love to squidge! 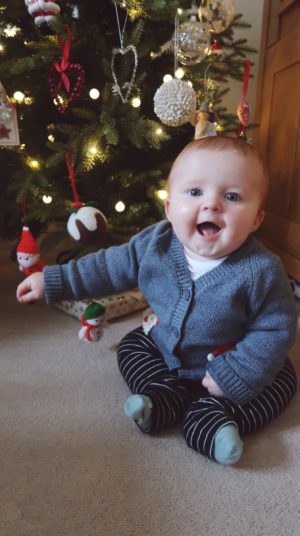 You’re currently wearing 9-12 month clothing and starting to move into some 12-18 month bits as well. I can’t seem to fit you in any non stretchy trousers, especially not poppered or buttoned dungarees as they just burst open when you are sat down! You’re in a combination of 5 or 5+ nappies, which is just madness as they’re the size nappies Oliver wears to bed! Anyway you’re an absolute delight. 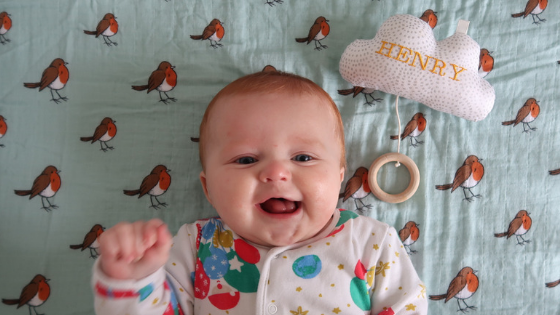 You’re always so happy, rarely cry (other than when your brother kicks, hits or lies down on you, which is getting less and less now thank goodness!) and you’re just a pleasure to be around. It’s lovely seeing your personality coming through now you’re able to move and interact a little more. Oliver loves spending time with you, just not when you pull his Brio tracks apart or when you pick up his toys!